You know the saying, “When life gives you lemons, make lemonade”? 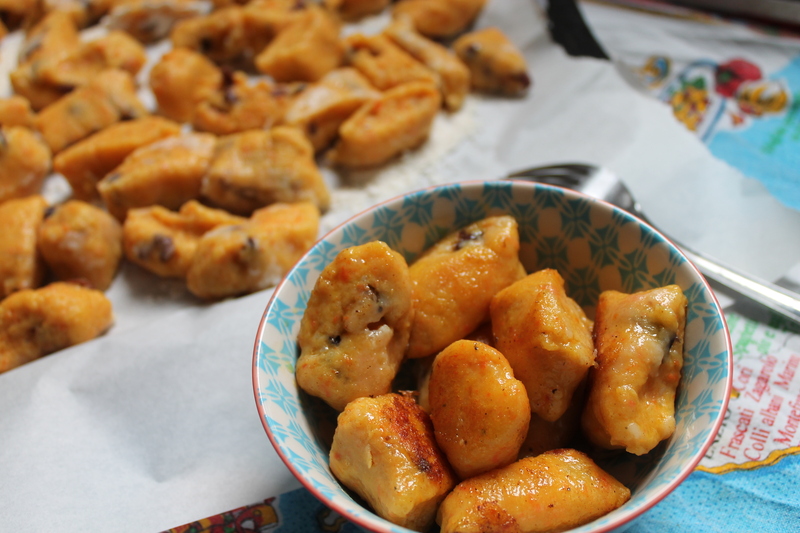 Well, when life gives you rapidly aging carrots, you make Carrot Gnocchi. And you throw in some black olives for good measure! We were inspired both by Maria Elia’s Greek version Anchal learned at Leith’s last week and Mark Bittman’s New York Times recipe – both of whom are fabulous chefs. Carrot and black olive is an interesting mix of sweetness and saltiness, and the spices add a bit more depth to the gnocchi. Perfect to eat by itself or perhaps with pesto or a tomato sauce. Buon appetito! Preheat the oven to 200C (fan-assisted) for 10 minutes. Place the potatoes directly on an oven rack in the middle of the oven (or you can use a lined baking tray) and bake for 1 hour until the potatoes are completely cooked through and tender. Meanwhile, prepare the carrots. Slice and cube the the carrots. Add the oil to a hot frying pan, add the carrots and turn the heat down to low. Cover with a plate (if you don’t have a cover to your frying pan, like us) and cook until soft. This took us 15 minutes. In a food processor, puree the carrots until it resembles a very fine mash. Leave aside. When the potatoes are done, slice in half and scoop out the insides using a spoon. Put aside the potato skins (these would be fabulous with some melted cheese!) and put the rest of the potato in a bowl. If you don’t have a potato ricer, mash the potato so that it is completely smooth. Turn the potato out onto a well-floured work surface. Add half of the flour at first and mix so that it is completely incorporated. If the dough is still sticky and you prefer your gnocchi to be more doughy, add the flour until you get the consistency you want. We used all of the flour. 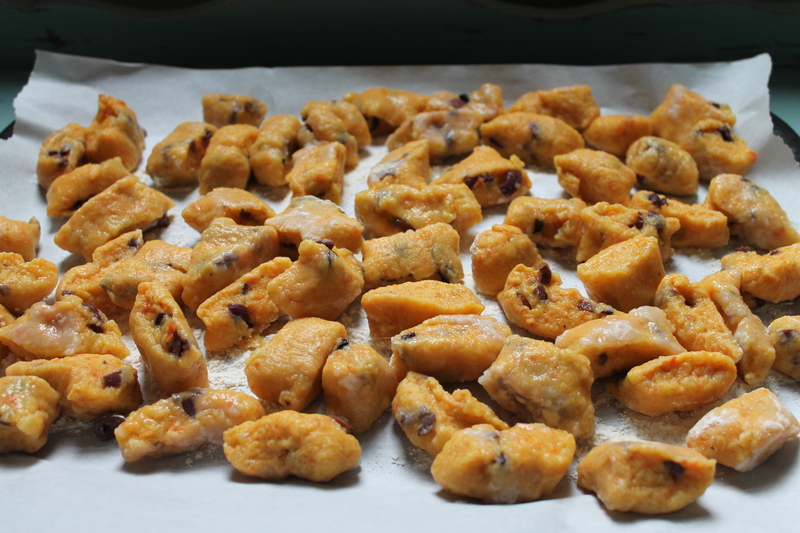 Add the carrot puree, nutmeg, salt, pepper, egg and olives to the dough. Mix methodically so that all ingredients are thoroughly incorporated. Fill a large pan with salted water and bring to the boil. To test your gnocchi’s flavour and texture: Break off a piece of the dough and add to the boiling water. When it rises to the top (after 1 minute), remove from the pan using a slotted spoon and taste. If it needs some more seasoning or flour, this is your chance to add these ingredients to the dough and re-mix. Divide the dough into 4 portions. For each portion: roll the dough into a ball onto the floured work surface, then roll into a 1 inch-diameter “sausage”. Using a sharp knife, cut off 1 inch pieces and set aside on a baking tray that has been lined with baking paper and floured. Add the gnocchi to the pan of boiling water and as they rise to the surface, remove them from the pan with a slotted spoon and place them in a bowl of cold water. Then after a few minutes, place them back on the tray. In a frying pan, melt a knob of butter and add the gnocchi (or as many as you’d like to eat at that time). Fry lightly, turning them all the time. After they are golden and slightly crispy (after 5 minutes), enjoy immediately. 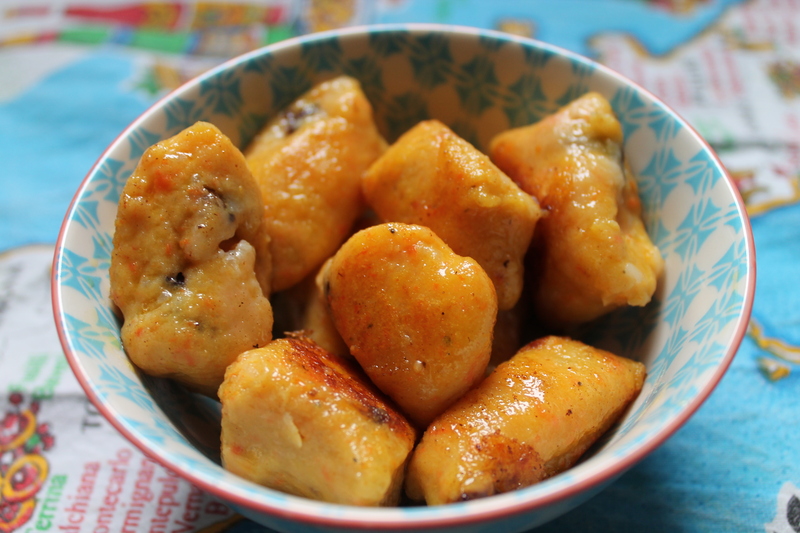 Any gnocchi you do not consume can be stored in the fridge for up to 2 days. This recipe made my mouth water! Not difficult but is the recipe difficult? I have never made gnocchi or pasta, for that matter. See you soon, girls! Hi Aunty Ruth! We’ve never made pasta or gnocchi before either (too wary) but it was pretty easy and a very forgiving recipe. I would say that it is a bit time-consuming as you need to allocate time to roast the potatoes, but so worth it. Let us know if you make this!